I'll keep a list here of significant changes made to the Man Homepage. 25 April 2015 : With thanks to Horst at www.blade-fotographie.de, added some excellent photos from Duisberg to the gallery. 3 October 2011 : Added the photos from Leamington to the gallery. 3 October 2011 : Added the live review for Man plus special guest Deke Leonard on October 1. 23 September 2011 : Marking the sad passing of Clive John, a few superb pics courtesy of Fast Max have been addd to the gallery. 21 September 2010 : Second Pontarwawe review and pics now posted. 5 September 2010 : Review and photos of the first Micky Jones memorial gig at Pontardawe posted. 23 June 2010 : Two tribute/memorial gigs for Micky Jones announced. 3 June 2010 : A few upcioming German live dates added. 13 December 2009 : Updated the TWC page to reflect the fanzine's sad demise. 9 October 2009 : Added review and pics from The New Roscoe gig. 4 October 2009 : New review and pics from Hebden Bridge added. 24 June 2009 : Colwyn Bay review and photos have now been posted. 18 June 2009 : Review of the previous night's gig at the Robin2 has been posted, plus a few photos in the gallery. 24 April 2009 : Review of the album Kingdom of Noise now available in the CD section. 1 March 2009 : A list of dates for the Martin Ace lineup of the band have been posted. 14 October 2008 : A couple of things... I've made a few cosmetic changes to the site design, nothing radical, just a minor smartening up. The photo gallery, though, has seen a significant change. It will all be explained when you get over there. 19 March 2008 : Review of the Leeds gig now posted, and a photo gallery of stills taken from the video shoot. 15 March 2008 : Following the Chester gig, you can find a live review, and a gallery of photos in the appropriate places. 14 January 2008 : A small UK tour has been announced - details on the dates page. 30 December 2006 : A few German tour dates listed; some terrific pics from San Francisco in the Gallery; and a review of Diamonds and Coal. 22 July 2006 : Added a review of the Live at the Rex DVD. Also, the site has finally... only about 10 years after I was going to... been transferred to its own domain, www.manband.co.uk. 7 April 2006 : It's been very quiet for Man related news, so I've put together a quiz so Man fans can keep their wits sharp. (If they had any wits to begin with, that is). 9 October 2005 : Added a live review of Iceberg at Blackpool. 24 September 2005 : Yet more wonderful photos from Norman Hobbs have been added to the gallery. 17 September 2005 : Some great 70's pics added to the gallery; and a couple of excerpts from the programme for the 1972 Oval programme in the miscellaneous section. 25 July 2005 : Iceberg at the Plough review from 22 July added. 8 January 2005 : A few new tour dates have been added. And another redesign... It's been almost three years since the last one. I keep thinking I'll just leave it as it is, but... I can't stop tinkering. This version is pretty much all CSS and XHTML. Pretty much, but not entirely, compliant code. There will be a few validation errors, but life's too short to worry about them. Apart from being a better way to write code, it keeps file sizes down. HTML files are generally half the size of the previous version. On a related subject, I encourage everyone (who hasn't already) to ditch Microsoft Internet Explorer, and to get a better browser. Such as Firefox. It's quicker than MSIE, it's got more features than MSIE, it's more secure than MSIE. And it's free. What's stopping you? 12 December 2004 : From Hebden Bridge, a live review and some photos in the gallery. 26 October 2004 : Added live review from Scarborough. 9 October 2004 : Doncaster live review posted. 31 July 2004 : Updated the odd bio and published a few dates for the autumn. 9 May 2004 : Trades Club pics and live review posted. 20 April 2004 : Review and photos from 100 Club gig added. 19 October 2003 : Added review from the second Blackpool gig this year. 4 October 2003 : Review and pics from the Trades Club gig now available. 7 June 2003 : Review and some iffy pics from Ashton now posted. 12 May 2003 : I don't usually bother updating this page for a single pic, but the grinning face of a very healthy looking Micky Jones in the Gallery makes it worth the effort. 16 February 2003 : Thanks to Rob Beale for the new pics from Wrexham to be found in the Gallery. 9 February 2003 : Blackpool live review and photos added. 2 December 2002 : Two live reviews added, Birkenhead and Leeds. 27 October 2002 : Review and pics from the Trades Club added. 25 July 2002 : A review of the Boardwalk gig from July 24; and photos from same in the Gallery. 1 June 2002 : Some rare Alkatraz pics from a private party now in the Gallery, thanks to Anna. 9 May 2002 : Added reviews for the Undrugged and Flying Aces CDs, and the Pub Quiz TV programme. 28 April 2002 : Further photos from the recent tour now available in the Gallery. 15 April 2002 : Live review from The New Roscoe added, plus a few pics. 23 March 2002 : Live review from The Flowerpot added. 22 March 2002 : Live review from Ashton, and CD Review of Unfinished Business have been added. 10 March 2002 : Kudos to Mark Davies for the additional photos from Blackpool to be found in the Gallery. 3 March 2002 : The first date of the current tour, at Blackpool, is reviewed in the Live section, with pics in the Gallery. This is what it has looked like for the past couple of years; if you scroll down the page, you'll see what it looked like prior to that. And prior to that, well, you really don't want to know. There have been a few minor content amendments to go with the new look, and I've verified everything in the Links section, which is a bugger to keep up to date. 22 January 2002 : A trek around the UK, possibly to go down is history as The Undrugged Tour, is shaping up nicely; details in the Dates page. 8 November 2001 : More Charlotte pics in the gallery, this bunch much better lit than my own. 31 October 2001 : A live review of the Charlotte gig, and photos from same in the gallery. 21 October 2001 : On the front page, tax your brain with a sliding tile puzzle. 19 August 2001 : Here's a first - A Man DVD, reviewed in the TV & Video section. 6 July 2001 : Not much - a few new dates, and a few links updated. 7 April 2001 : More photos from the splendid Kite Club gig in the Gallery; a review of the '99 Bootleg CD; and quite a few German tour dates are announced. 12 February 2001 : Nineteen photos from the Blackpool gig a couple of days ago are now in the gallery, and the review and further pics are in the Reviews section. 6 December 2000 : A few new year gigs are announced. And if you haven't seen it, you might want to check out Malcolm Morley's new site. 1 October 2000 : The live review from Ashton, September 20, is now in place, plus a bunch of photos from York and Aston in the Gallery. 17 September 2000 : Added a live review from York, September 10. 12 August 2000 : Dates have been announced for an extensive German tour with Eric Burdon during November and December. Also, I've updated the visitor stats in the Miscellaneous section, and included some figures about where you all are. Hello Kyrgyzstan! 16 July 2000 : a dozen or so UK gigs for September are announced - listed on the Tour Dates page. 27 June 2000 : Four more pics in the Gallery; these are from 1992 kindly provided by Richard Gudge. 18 June 2000 : Added the review of the new CD release Endangered Species. 8 June 2000 : Some new photos in the Gallery from the recent German gigs, thanks to Peter Brandholm. 15 April 2000 : In the Micellaneous section, I've added a few stats about the Man Homepage, and about you, the visitors. 5 April 2000 : Hot off the presses, a review of the April 1 gig, with photos in the Gallery. I've also included on the message from the author page a pic of where it all happens. No alcohol is visible, but there is plenty of caffeine. And I'm very fond of that 21 inch Taxan and the TA. 25 March 2000 : With recording of the new album completed and a much looked forward to gig in Cardiff coming up next week, it seemed like a good time to give the site a makeover. The new look is deliberately unfussy and understated; navigation should be a little clearer, but I've only tinkered here and there with the content for the time being. Any comments welcome at the usual source. For any nostalgics out there, this is how the Man homepage used to look. 26 February 2000 : A sizable European tour is announced... dates are on the appropriate page. 10 February 2000 : I've dug out some old reviews from Autumn 1993, and added two further CD reviews, for the Padget Rooms and the joint Man / Iceberg BBC release; and just tweaked the band bios. 30 January 2000 : New gig announced for April 1... no fooling... and I've added a random image to the main page. 20 January 2000 : I posted a graphic of the map from BGTYALOAD last year; I've now made Windows wallpaper featuring the map available for download from the same place in the Miscellaneous section. 14 January 2000 : A couple more CD reviews, the Greasy Truckers and Official Bootleg. 19 December 1999 : The usual new links here and there; but mainly some new photos in the Gallery, grâce à Frederic Loridant. July 21 1999 : After a quiet few months here, a new live review from the Torrington from mid July. 11 April 1999 : A couple more links and a couple more reviews - Back Into The Future and Before Your Very Eyes: and in the Miscellaneous section, a brief review of Mannerisms II. 28 March 1999 : A few things - Review of Be Good to Yourself completed, and the remarkable map from the cover is featured in the Miscellaneous pages; plus a photo from gallery1, and another link added. 03 January 1999 : I've finished off a few things which I started ages ago... CD Reviews of All's Well That Ends Well, Star Club 98 and the Donovan's Brain album; and following a few requests, there's a brief and incomplete Man discography in the Miscellaneous section. 13 December 1998 : A few bits'n'pieces - photos in the Gallery from the Colne gig and a couple of new dates for early 99; on the Miscellaneous page, some merchandise, and yet more Japanese transcribed lyrics. 21 November 1998 : Review of The Welsh Convention 4 now on the Reviews page, including pics; and 10 more pics from the same event in the Gallery. 14 November 1998 : Thanks to Paul Hollingsworth for his review and photos from the Scunthorpe gig. 12 November 1998 : A Japanese take on some Man lyrics, on the Miscellaneous page. 8 November 1998 : Quite a few additions - two reviews from last weekend, another link to a German Man page, to celebrate the additions to the live set, two new audio clips; and finally, on the Man home page, the flyer for gallery 4. 31 October 1998 : Two more links of German origin - Georgie's page, and a site dedicated to Rockpalast. Danke ! 10 October 1998 : Two more pics from the Swedish festival added to the Gallery, including one of Nik Turner; and 15 more from Swansea. I make that 50 photos in all. Thanks again to everyone who has contributed ! 03 October 1998 : Finally, in the Miscellaneous section, a review of Rhinos, Winos and Lunatics, Deke Leonard's book. 26 September 1998 : A new section, Miscellaneous, has been added. I've moved the review of Unfinished Business here since it isn't actually a CD, and also some info on a couple of very rare and interesting singles. This is also where the review of Deke's book will go... and I've actually started it, so it should be RSN! 20 September 1998 : Wow... 16 more colour pictures have been added to the Photo Gallery, from the recent shows in Sweden and Swansea. There are now more than 30 in total ! 05 September 1998 : Some new material by someone other than myself (which is very welcome BTW) - a review of the Swansea open air gig and photos too - a round of applause for Paul Hollingsworth, please. Also, two reviews of the Space & Rock Festival held in Sweden in mid August; many thanks to Scott Heller and Peter Brandholm. 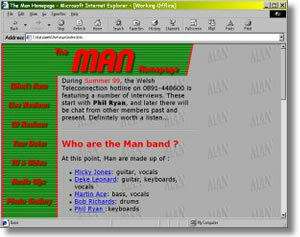 29 August 1998 : I've now completed the redesign of the Man homepage. I've tested as far as I can, so now I'm publishing it and will be asking a few trusted souls for their opinion before spreading the word more widely. The object of the exercise has been to provide a more consistent appearence, with better navigability. If anyone finds any broken links or has any problems using the site, let me know. Also feel free to voice any general criticisms. I'll certainly listen, but might not do anything about it.